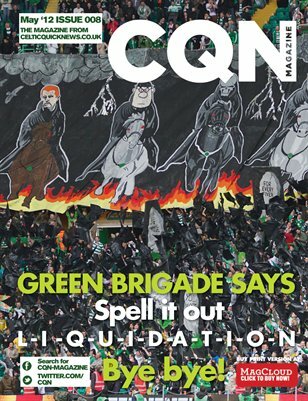 Celtic Quick News Issue 8 is the "Liquidation Issue", which celebrates Celtic's title triumph and looks forward to the impending collapse of Rangers (In Administration). Along with a selection of great Fan's Stories, there are articles on SPL Finance, and the role of the bank; an exploration of Rangers' debt addiction; a look at the Forgotten Hero Jonathan Gould; a piece on the Cup Final of 1972 and, of course, an examination of The Road to the Title. This is an issue of CQN you will not want to miss.